We’re so proud to be carrying a curated selection of Pew Pew Patches, especially when they are created and designed by Dawn Bey – one of the members of our Little Man team in our early start-up days! Named after the sound of lasers, Pew Pew Patches aims to reinterpret the hot item of the ‘80s in the voice of the millennials today while bringing back personality into mass produced identical-looking clothes. ​In collaboration with her partner, Danny Kostianos, the patches are designed and produced in small quantities so once they are sold out, they are never reproduced again. 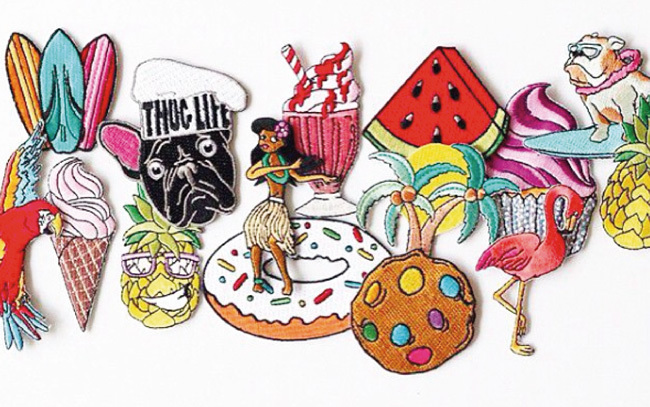 How fun are these cute iron-on patches! And they now come in a sticker version which our little tots (and ourselves!) absolutely love decorating their notebooks with. Spruce up your old jeans or denim jackets or even your tote bags. There’s endless cool possibilities with these little patches! Explore the world of Pew Pew Patches today on instagram with #pewpewpatches and shop our selection here. This entry was posted in Accessories, D.I.Y, Kids, Pew Pew Patches and tagged Cactus, DIY, Donuts, Get Creative, Ice Cream, Iron On, Kids, Make It Your Own, Patches, Stickers on November 16, 2016 by Little Man.